The scene at Lisburn Bus Station where a woman was struck by a bus and killed. 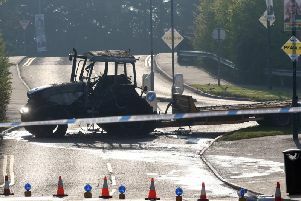 A Lisburn man is set to go on trial for the manslaughter of a woman who was struck by a bus at the city’s bus station. James Johnston, 33, of Killowen Grange, is alleged to have unlawfully killed Linda Stewart Rooney, 48, on December 29, 2014. A prosecution lawyer told Lisburn Magistrates’ Court that Johnston had a case to answer. The defendant made no reply in answer to the charge. Ms Stewart Rooney lived at Ashlea Place in Lisburn but was originally from the Dungannon area. As part of Johnston’s bail conditions he is to have no contact with his employer. A defending solicitor told the court that this was a particularly complex case. The case was adjourned to Craigavon Crown Court on April 25 for arraignment.